America's cultural divides go even deeper than we thought: some Americans don't even get Samoas and Tagalongs from their local Girl Scouts, but rather Caramel deLites and Peanut Butter Patties. Perhaps this explains my colleague Erin Gloria Ryan's woefully incorrect ranking of the cookies. Maybe you've already heard whispers in the dark about this unsettling truth, but the L.A. Times has an expose and accompanying graphic that reveals, down to the zip code, who's getting which cookies. You see, there are actually two outfits making Girl Scout Cookies: ABC Bakers and Little Brownie Bakers. The latter makes your Samoas, your Do Si Does, your Trefoils; the former just dubs 'em Shortbread and calls it a day. Other differences include less chocolate on the Thin Mints and more cookie in the Caramel deLites. The real trip is that ABC Bakers—despite producing cookies that don't even have the classic names—is actually the older of the two. They've been supplying the Scouts since 1937, while Little Brownie Bakers have only been on the scene since '74. So really, despite my very strong inclination (based on a childhood spent selling the damn things) to say that Little Brownie Bakers are the REAL DEAL, it would in truth be fairer to say they're the imitations. Also weird is the fact that Girl Scout Cookie distribution networks aren't divided up any way that looks remotely rational. It's council-by-council. So L.A. gets one supplier and Orange County gets another. South Georgia gets Little Brownie Bakers but South Alabama gets ABC Bakers. New York City gets one batch but Philly another. Do you feel as if you've missed out? Some Girl Scouts in Los Angeles County this week might be selling the other Thin Mints — the ones usually sold in Orange County. Little Brownie Bakers had "unexpected and unprecedented distribution delays nationwide" for some cookies and worked with ABC Bakers this week to send additional shipments to Girl Scout regions that were running out. 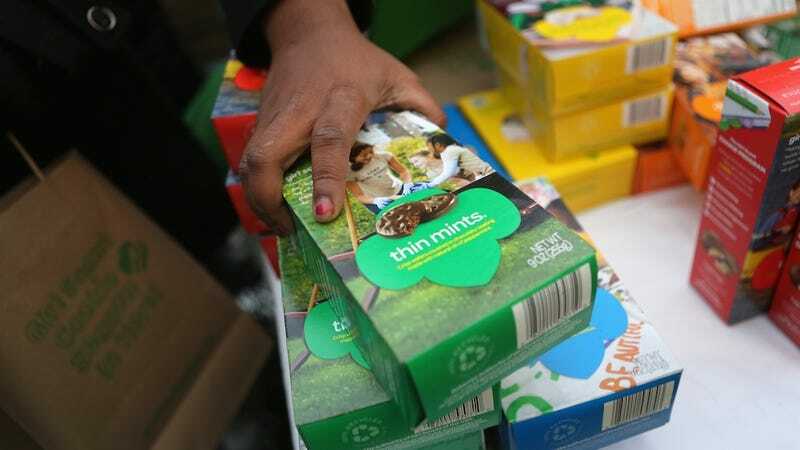 "Please note that this is not a common practice to get cookies from another baker — it is only due to the extreme circumstances of running low on the most popular variety that we are moving forward with this decision," Little Brownie Bakers said in an email Friday to Girl Scout troops in L.A. about the Thin Mints switch. Takeaway: Guard your Samoa stash with your life.